another great work by adidas – always achieving their brand motto “Impossible Is Nothing”. this is for their launch of the official World Cup 2006 match ball in the heart of Auckland, New Zealand. this campaign followed adidas’ global launch of its campaign for the FIFA World Cup 2006: +10. 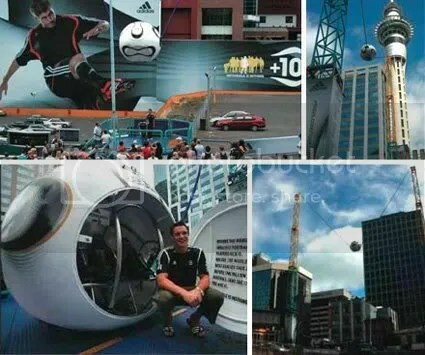 To create impact for the launch of the World Cup 2006 match ball and a true ‘Impossible is Nothing’ experience by having the people of New Zealand be part of the World’s largest sporting event. Where: ‘Sky Screamer’ reverse bungee site, heart of Auckland City. – An existing reverse bungee site was transformed into the new Adidas match ball. – The 2.5m high ball sat in front of the largest billboard site in the country, featuring Liverpool Captain and England striker Steven Gerrard. This looked like Gerrard was striking the ball. – A match commentary was broadcast by loudspeakers as participants were strapped inside the ball. – Then, just as Gerrard boots it, the reverse bungee was blasted into the air at over 170km/h. – The screaming occupants got to experience what it’s like to ‘Be the Ball’. Then walk away with an ‘in-ball’ DVD recording. – A unique way for people to experience the match ball, not just be there to look at it or kick around with it. – It allowed the audience to learn, interact and in an interesting way enjoy what it is like to be kicked at over 170 Kmph by Steven Gerrard. – They also got to experience a true sound and visual experience when they are strapped in the ball. – High production quality: The 2.5m ball was made of fiberglass and modeled exactly to be like the official match ball. Numerous tests were conducted to match the true speed of the ball kick off. – Link to sales: New Zealanders can ‘Be the Ball’ during a period of 2 weeks by buying any official adidas FIFA World Cup football or pair of adidas Predator football boots from any adidas store. adidas truly captured the spirit of their motto – “Impossible is Nothing” by presenting yet another “world’s first” work. This execution not only allows the audience to experience the match ball, but they’ve also managed to showcase the performance of their new product in a very powerful way.